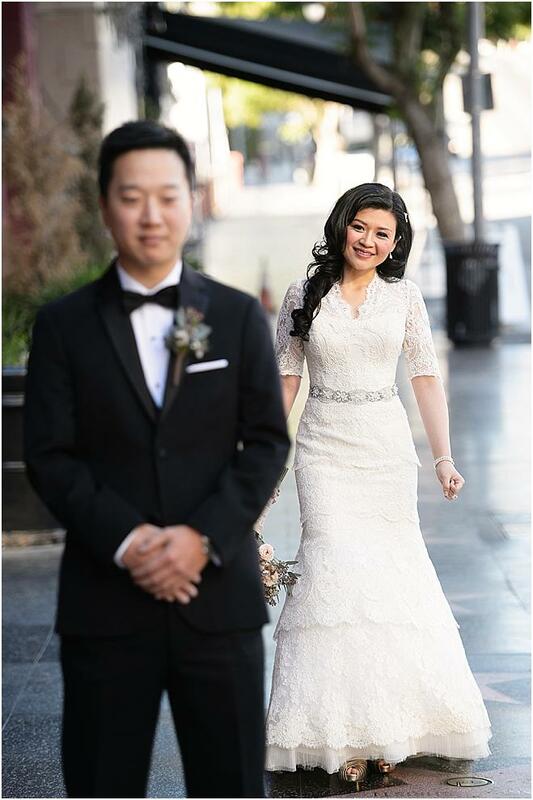 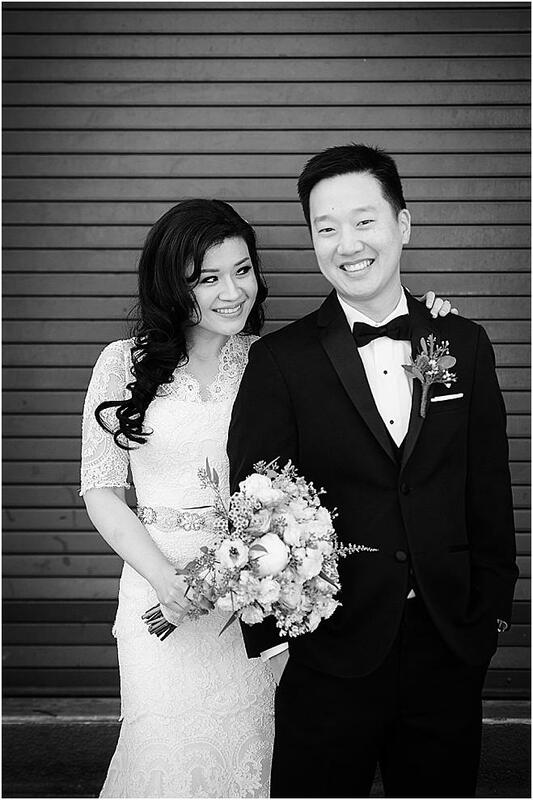 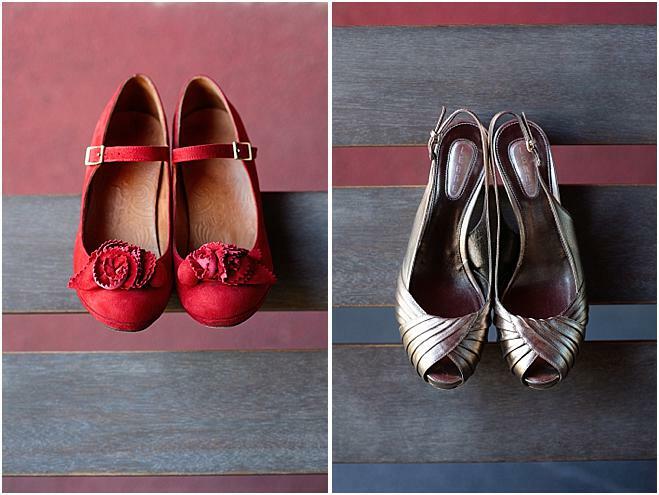 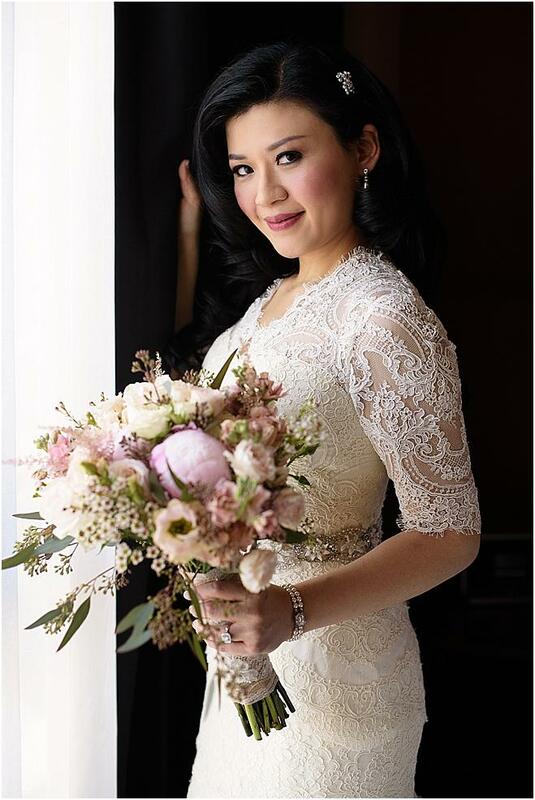 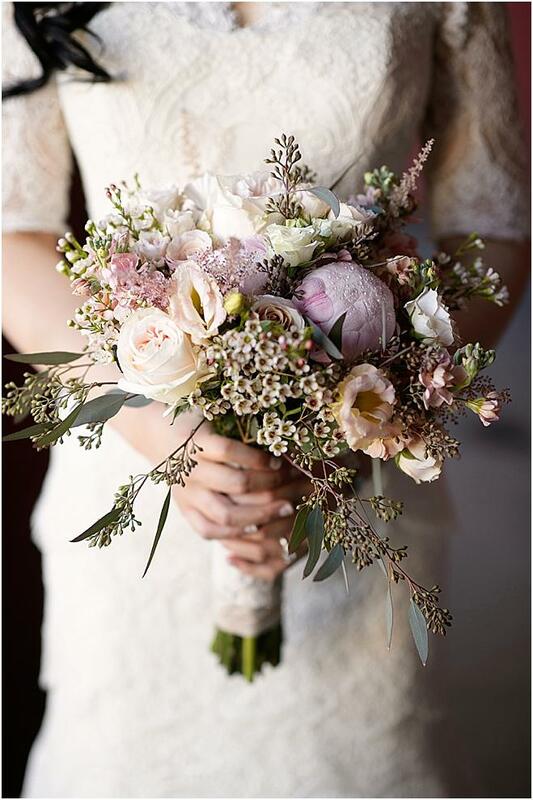 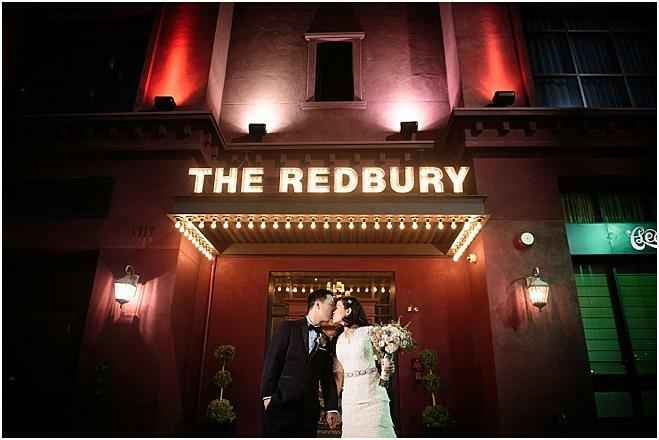 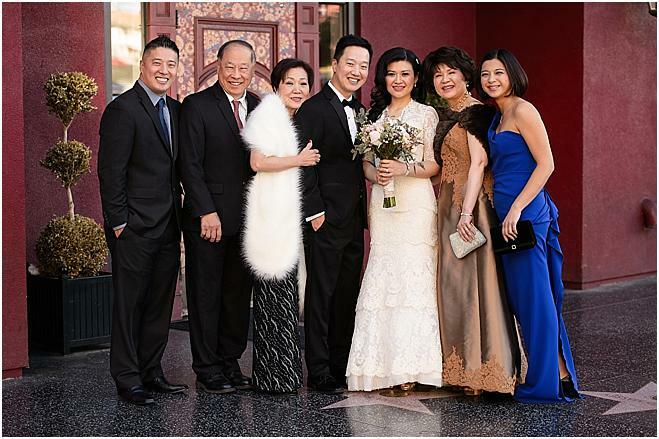 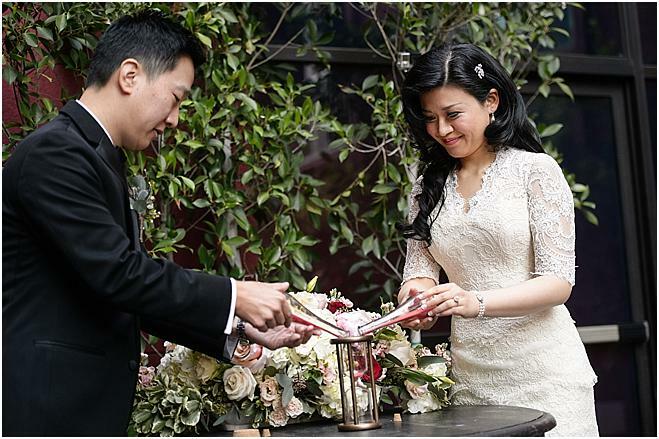 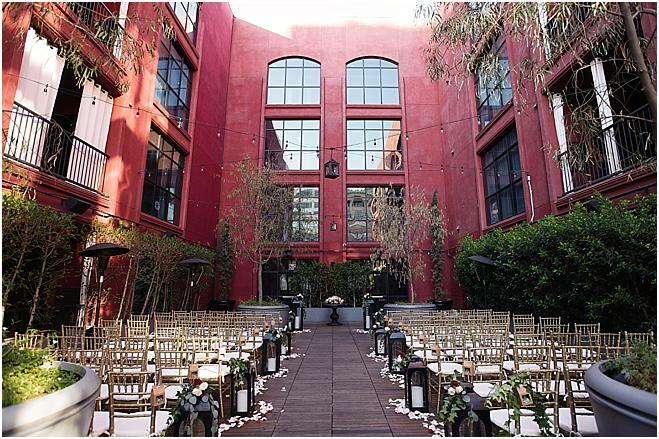 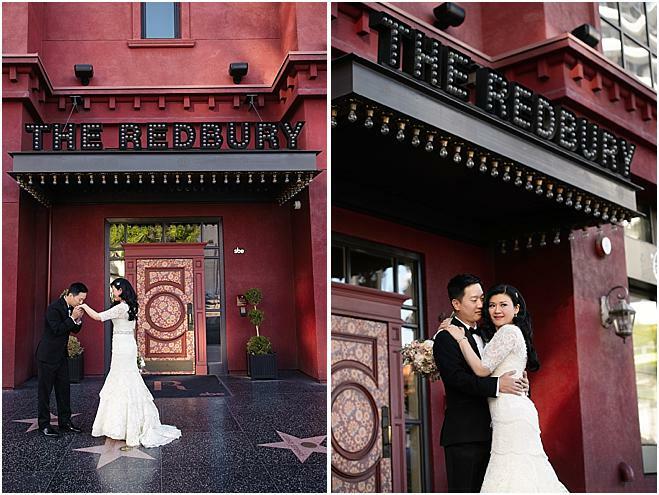 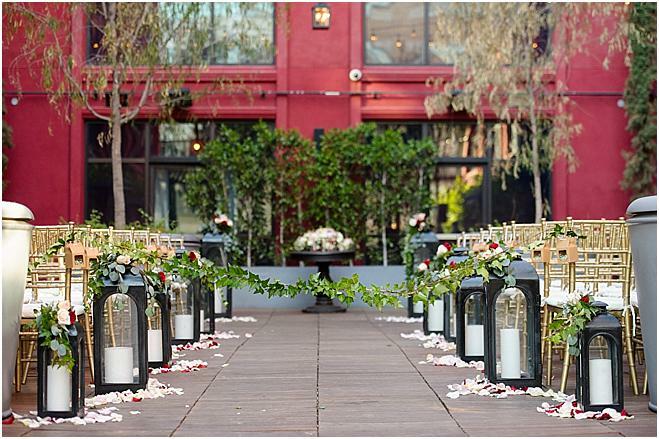 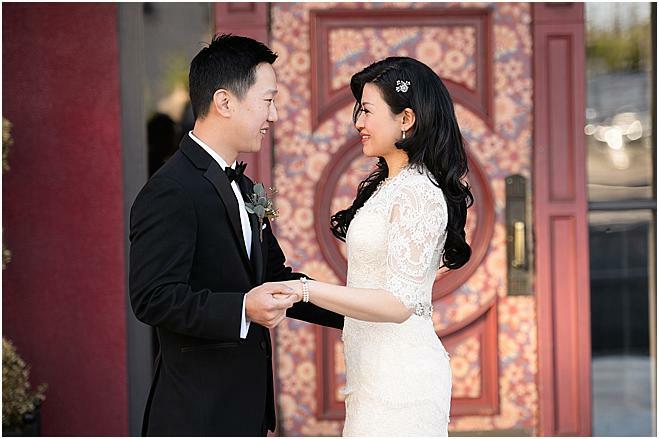 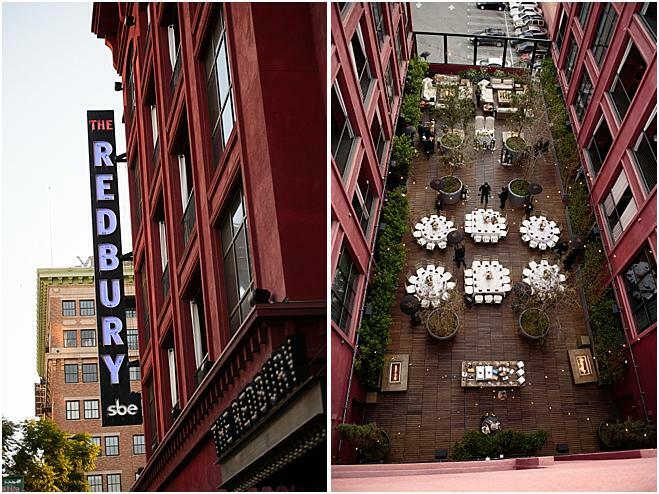 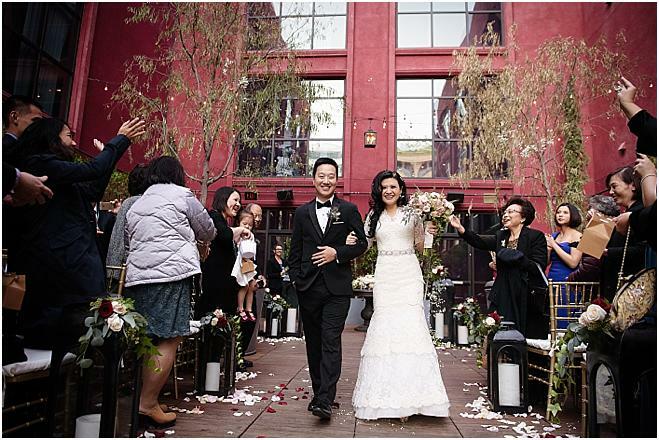 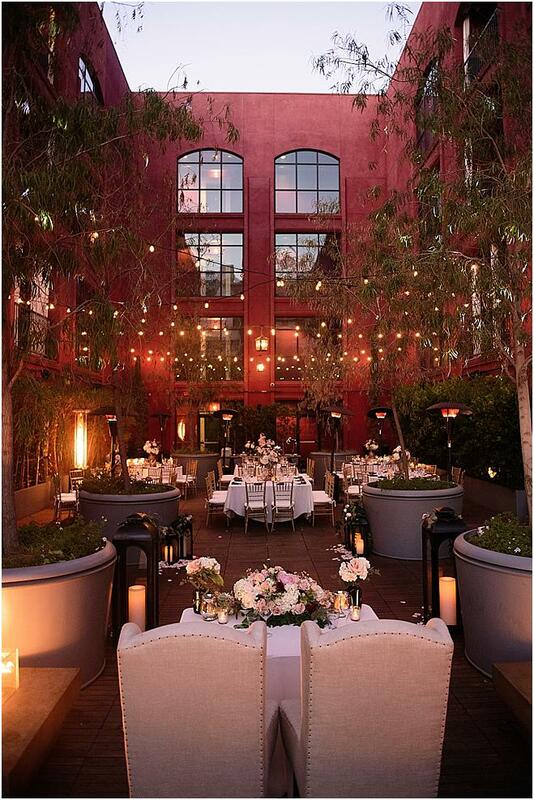 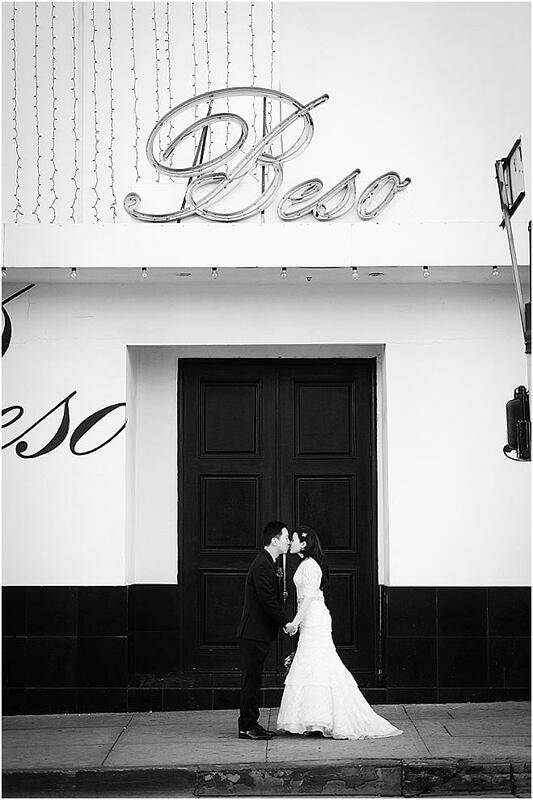 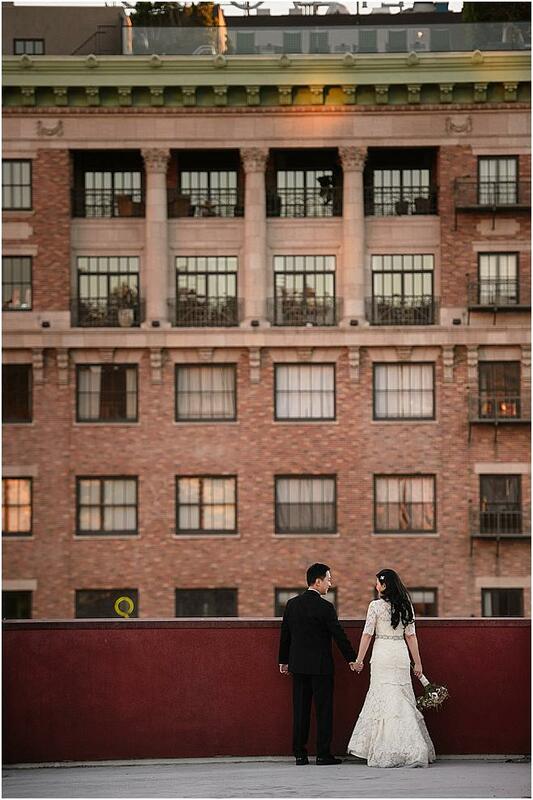 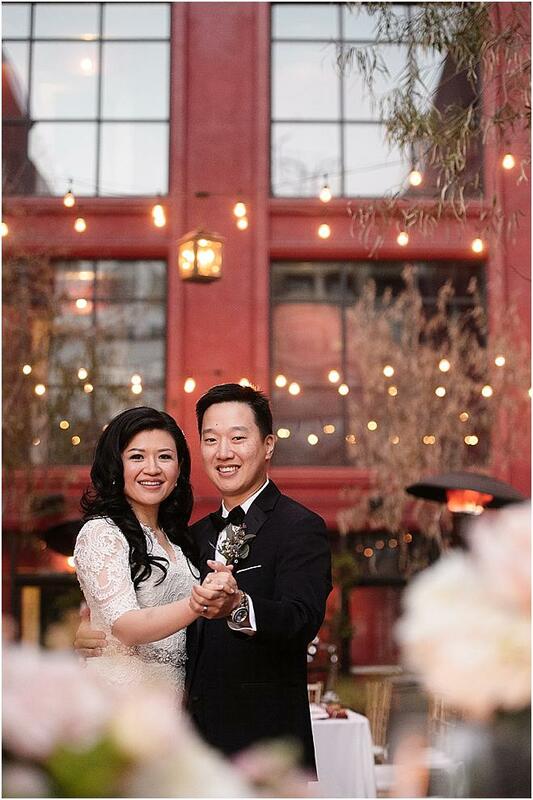 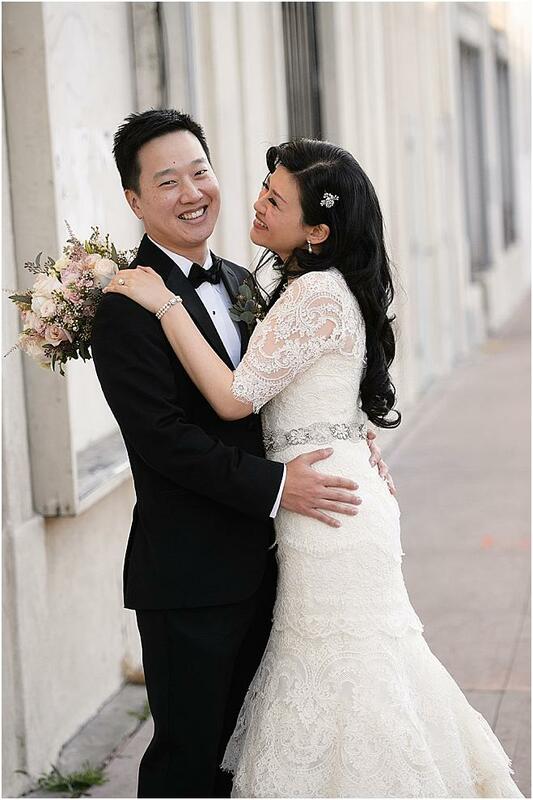 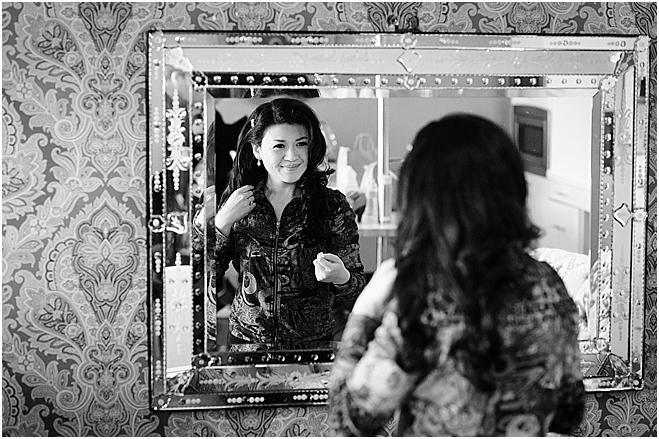 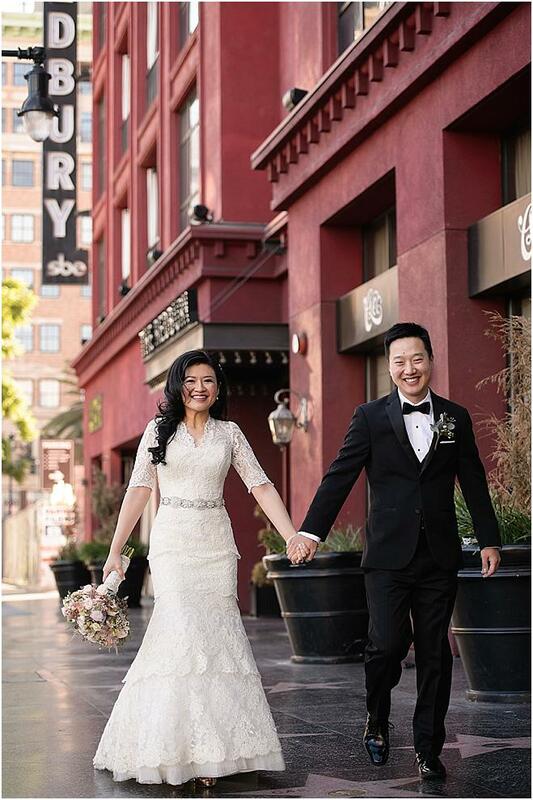 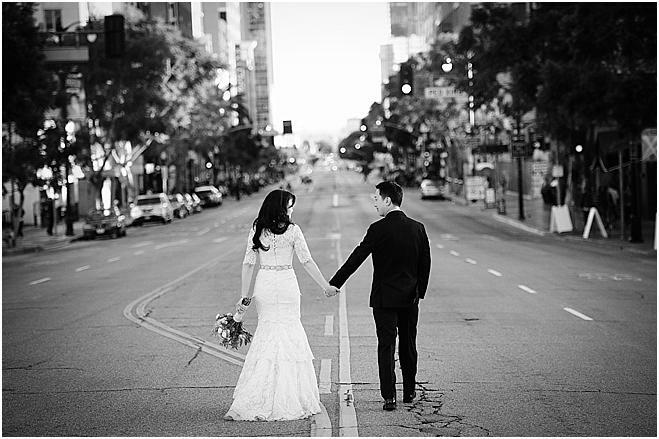 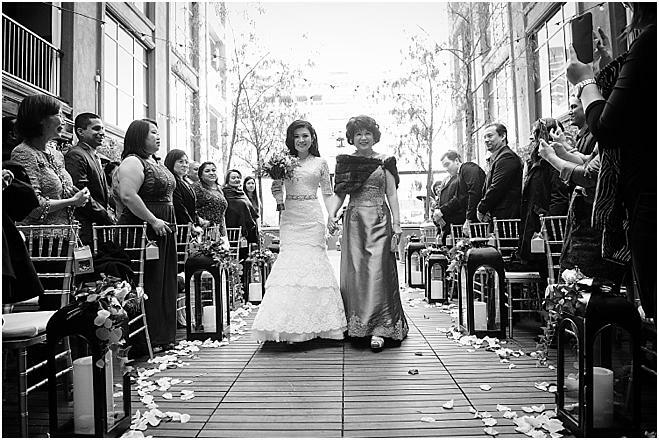 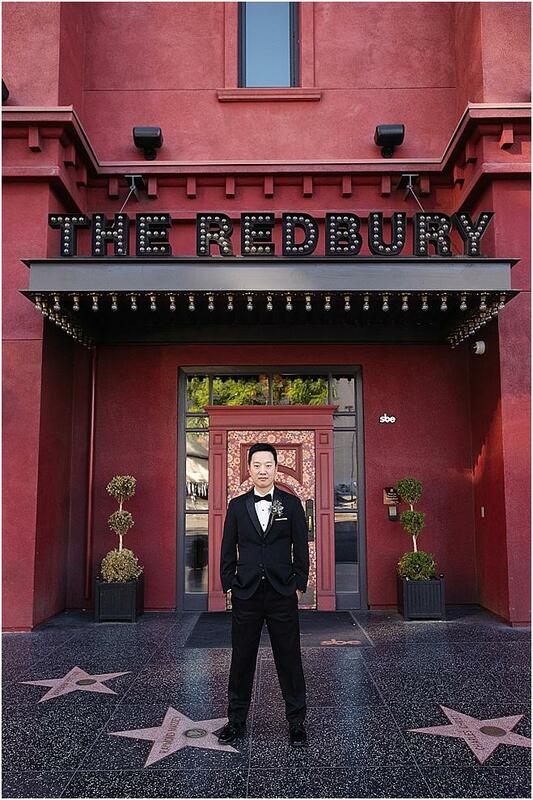 Daphne and Andy had an immediate connection with the Redbury Hotel, not only is it home to their favorite restaurant, Cleo, but Andy also proposed in front of the hotel after a romantic Valentine’s Day dinner. 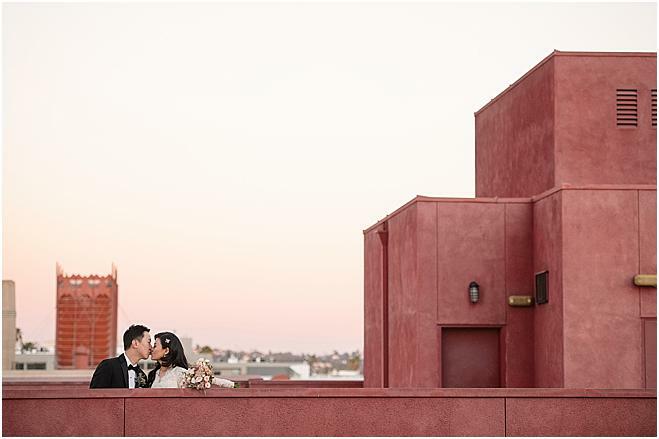 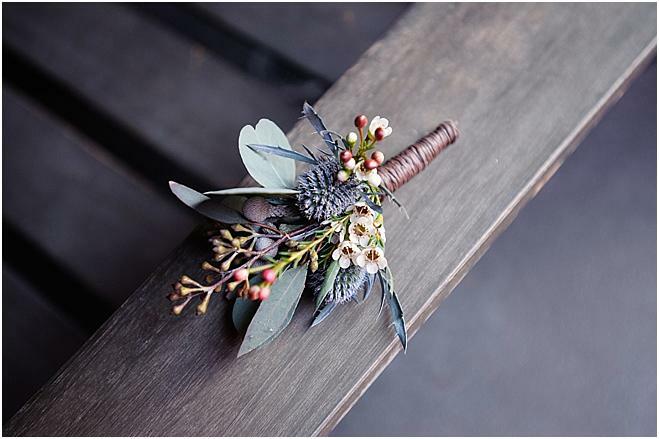 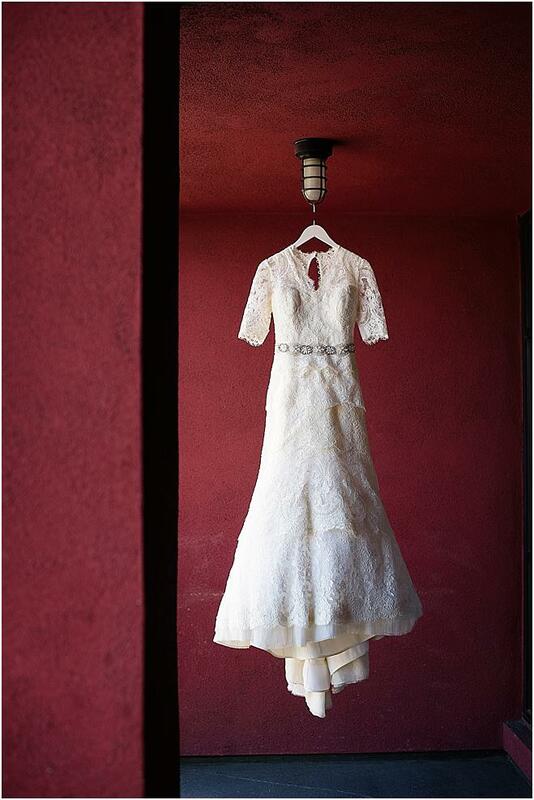 As architects, Daphne and Andy are constantly working to fuse intimacy and warmth into their projects—so designing their wedding was no different. 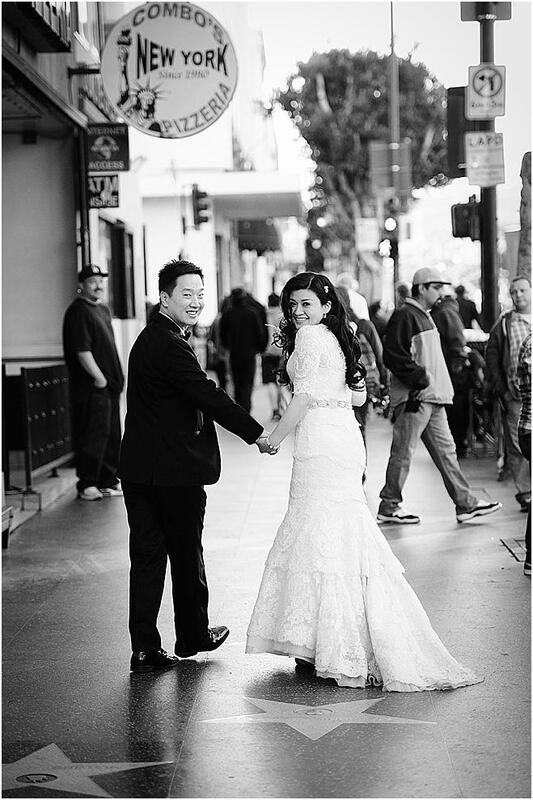 While Daphne is charmed by all things vintage, Andy loves the nostalgia of old Hollywood so both elements found their way into the design. 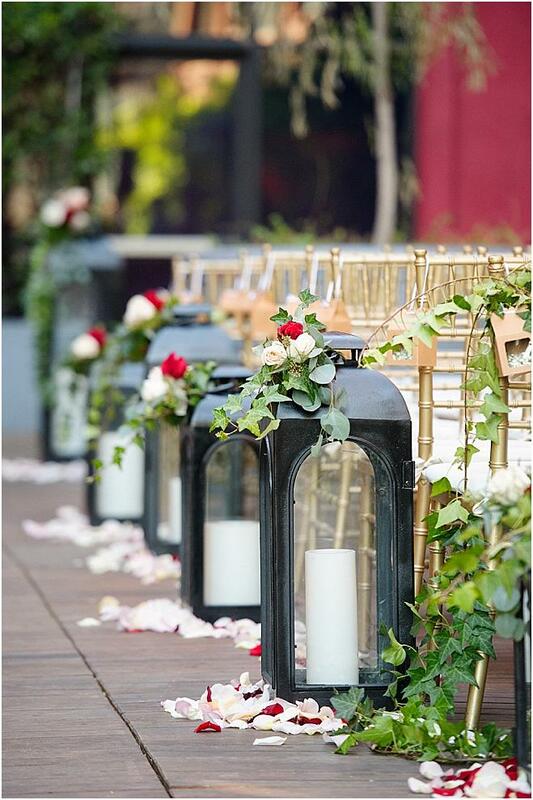 The creative duo sourced vases from Goodwill and refinished them with a faux gold and mercury glass look and paired the m alongside mottled glass votives. 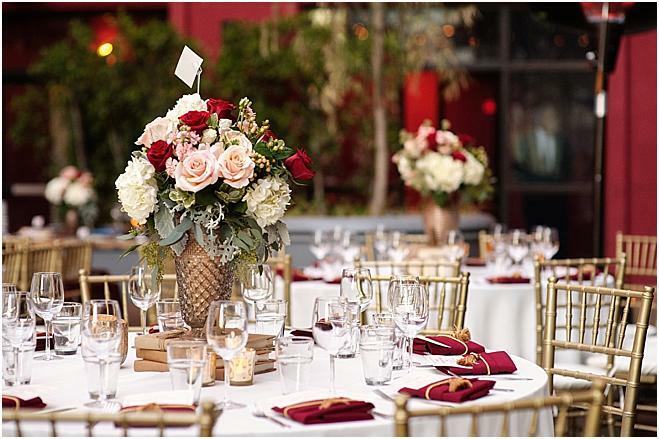 To create depth and dimension, the bud vases rested on books wrapped in brown paper and twine. 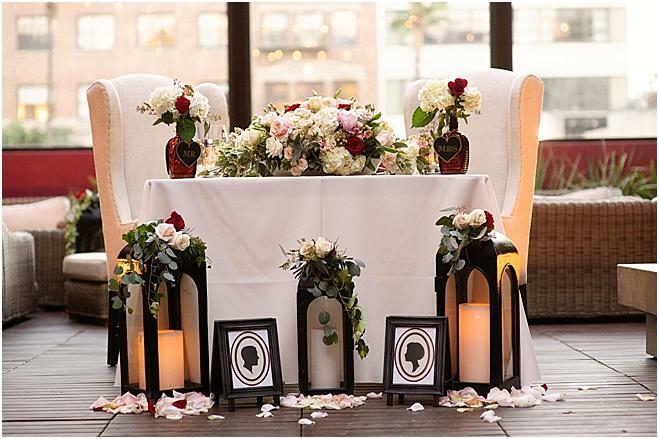 At the sweetheart table a mixture of vintage amber syrup bottles mingled with weathered easel-style picture frames boasting the couple’s silhouettes. 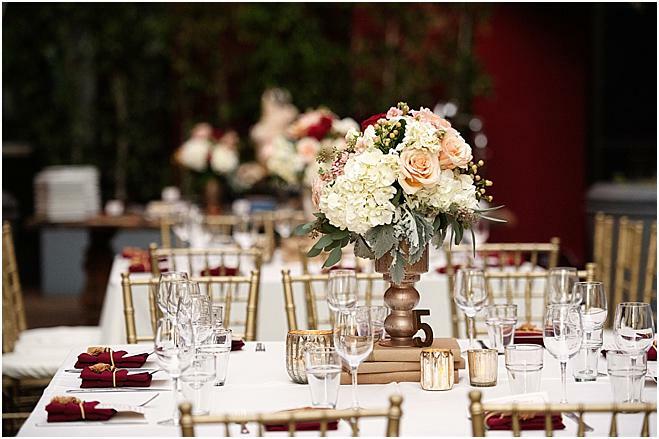 High-backed wing chairs made a bold finish. 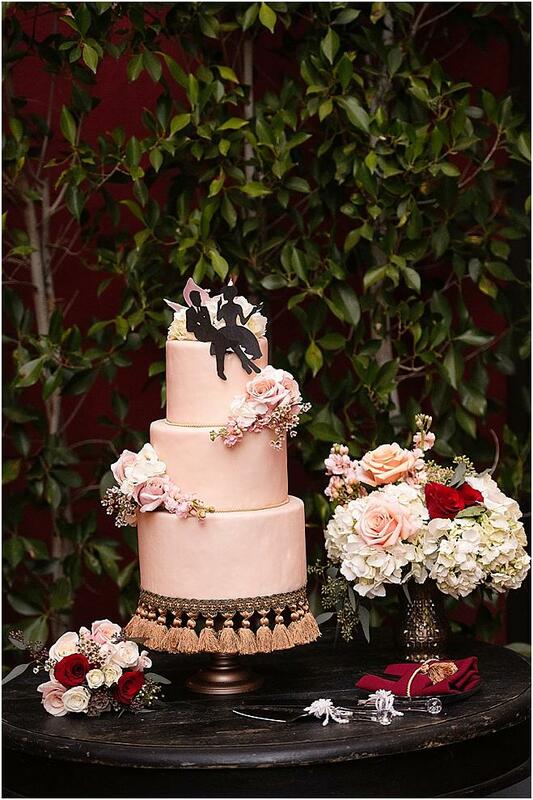 Daphne even made a decorative faux cake herself and Fragrant Flowers added blooms to it. 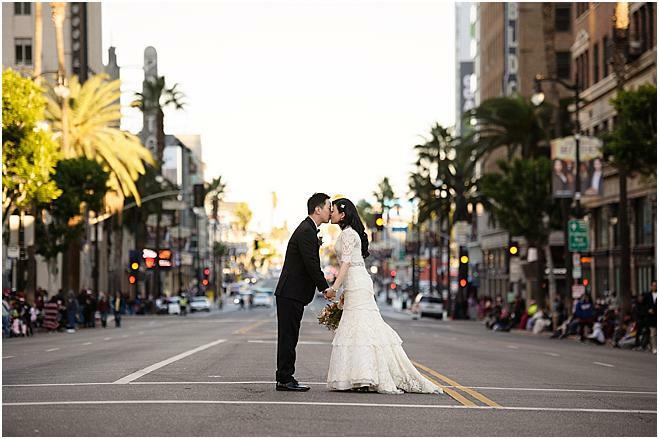 The Hollywood Christmas Parade was the same day as their wedding so the surrounding streets were closed—luckily not until after all their guests arrived! 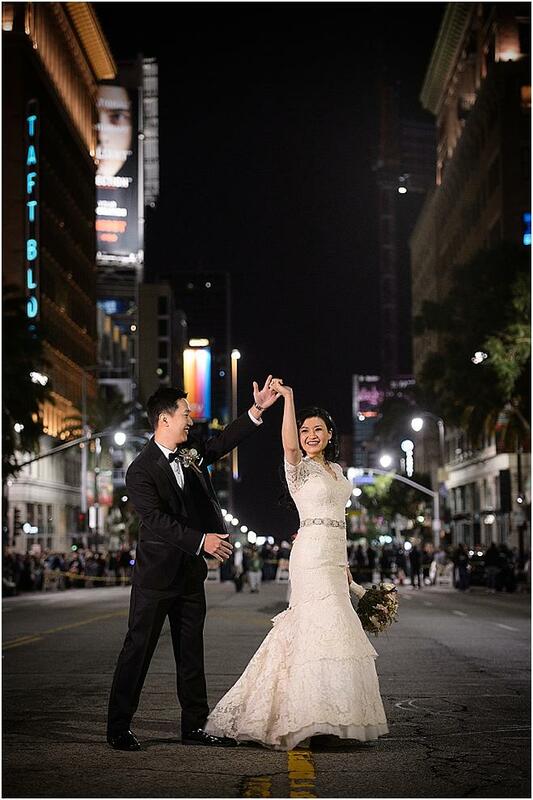 It ended up affording guests a rooftop view of the parade as well as the opportunity for their photographer, Next Exit, to capture one-of-a-kind shots on the traffic-free Hollywood Boulevard. 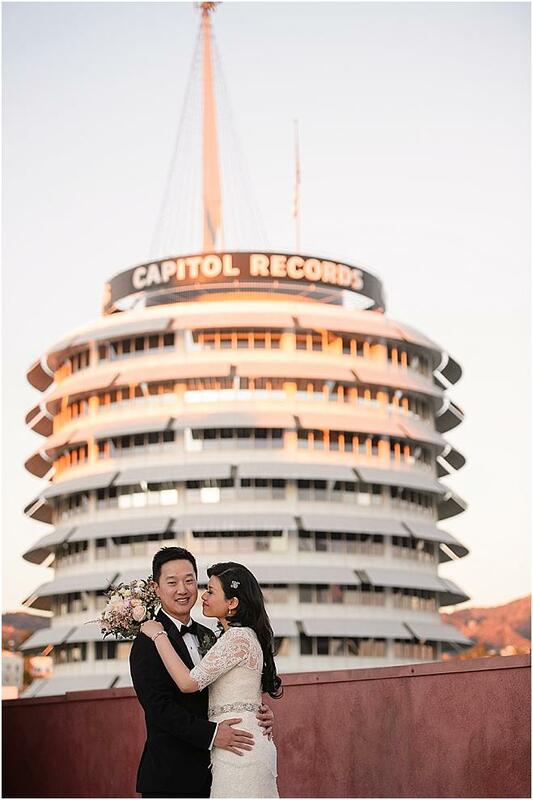 Just as the couple took the floor for their first dance to Ed Sheeran’s “Thinking Out Loud,” the Goodyear Blimp cruised overhead flashing Congratulations—unplanned and unforgettable!